Making a house a home is one of the great pleasures in life. Putting your own stamp on a property and turning it into your little sanctuary is a joy to see. One of the many ways of doing this is by having lots of family photos and personalised artwork displayed around your many walls, and lets be honest bare walls always look better when they're filled with gorgeous art that's personal to you. That's where Twenty Fingers come in. 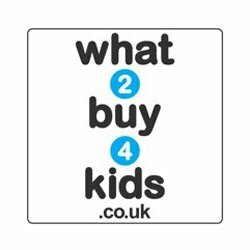 They're a lovely husband and wife team based in Milton Keynes, Buckinghamshire who have a passion for design and photography. 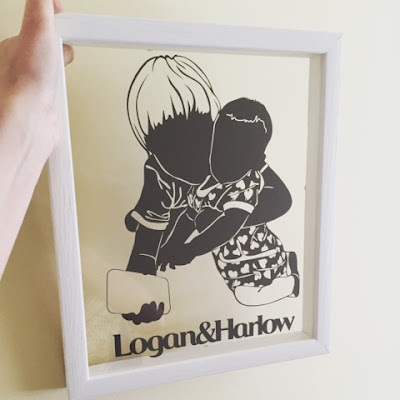 Their specialty is designing and hand making beautifully framed papercuts that are personal to each individual. Here's a little bit more about Lana and Ivan in their own words: "Although we may only have twenty fingers between us, we have a million ideas that are used to create our unique home décor gifts and quirky artwork. All of our products are handmade by ourselves, here in the UK. 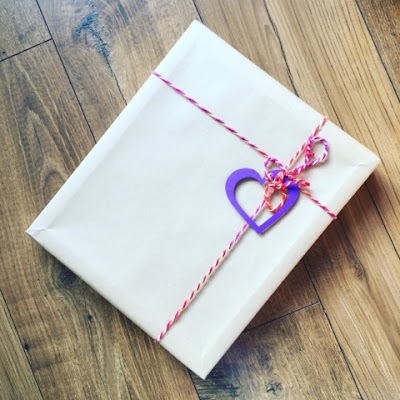 We put love, care and attention into every single item we make to ensure we provide gifts that you will be proud to give. We value quality above all and use natural materials such as paper, wood, glass and metal in the production of our handmade gifts." With so many gorgeous papercuts to choose from it was a really hard decision for me to make, what should I review! 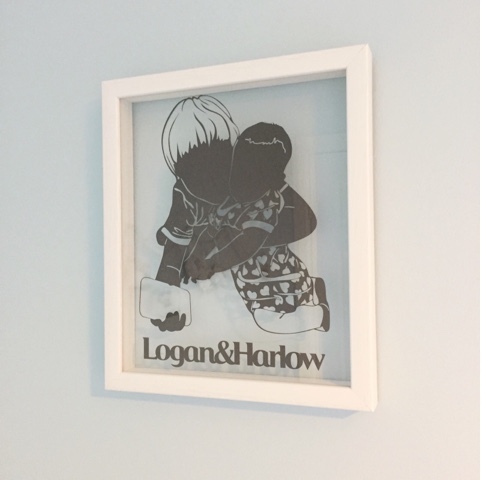 In the end I chose a cute photo of Logan and Harlow that would be made into a papercut from grey card and framed in white. The plan was it would either be hung in the home office, living room or Harlow's bedroom. In the end I went for Harlow's bedroom as it looks really lovely up on her wall above the changing unit. As well as children's papercuts Twenty Fingers offer a wide range of papercut options from; cats and dogs, family tree, family silhouette, text, lyrics and quotes, house papercuts, baby ultrasound scan, and some super cute new baby papercuts which can have a photo of your newborn included. How sweet. Prices start from as little as £29 for a 10" x 12" papercut and obviously increase if you want the larger 12" x 16" size or if you include a frame as well. The frames come in a handful of colours but there's a larger selection of colours for the actual papercuts. Everything from hot pink, black, white, yellow, green etc so plenty to choose from. The papercut I received, like I said, is a standard 10" x 12" in grey with a white wooden frame and standard glass to complete the piece. Twenty Fingers do offer Invisible TrueColour glass which is awesome. I've seen it used at a local framers and it definitely makes the art work stand out a lot more. This is £15 extra for a standard papercut or £20 extra for the large. My personal papercut would have come in at a very reasonable £63 considering it's a personalised handmade work of art. Twenty Fingers do have special offers quite a lot so keep an eye out for them. They currently have a special £5 off discount code if you purchase a papercut before 7th March. Plenty of time to get your order in for Mother's Day then. Just enter 5OFF at the checkout. So what do I think about my actual papercut? Well I love it. The craftsmanship put into this is superb. You can clearly see that time and care has been taken to create this beautiful gift just for me and it's a totally different take on a family photo. I love hanging family pictures around the house but this is something different, eye catching and definitely a little talking point for anyone who sees it. I'm very thankful to Lana for contacting me to review one of her papercuts, they're honestly brilliant. I even ordered one to give to a friend I liked it so much! Please do check out the Twenty Fingers website www.twentyfingers.co.uk and drop by their Facebook, Twitter & Instagram to see what else they get up to. I received this item free of charge in return for an honest review. 0 comments on "Review: Twenty Fingers Handmade Papercuts"
Mother's Day Gift Ideas for Me!